HUGE news! I am going to be in a book! 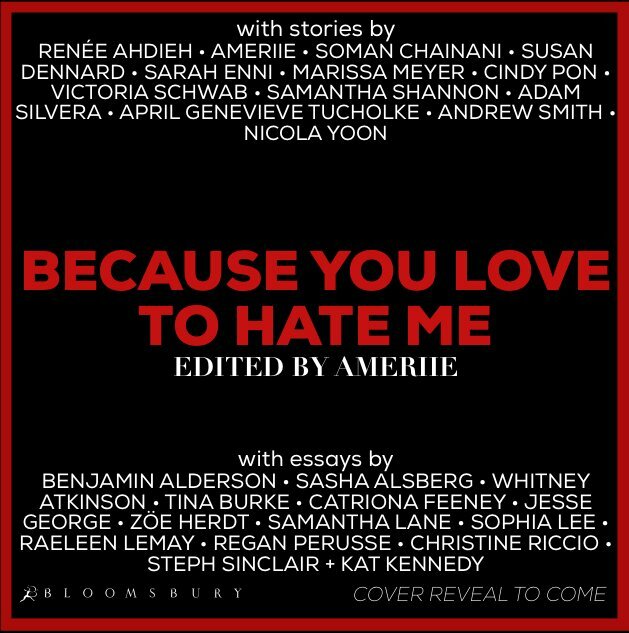 Specifically, I’m participating in the YA villain-themed anthology, Because You Love to Hate Me curated by Ameriie, which is being published in July 2017 by Bloomsbury simultaneously in the US and UK, and as an audiobook in the US and UK. I’m not participating as an author but as a booktuber/blogger. More information below the cut! Aaaah! You can check out Ameriie's announcement video here (and the others at their individual channels & spaces). Also the official Publisher's Weekly announcement here. 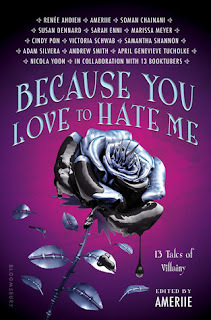 Add Because You Love to Hate Me to your Goodreads shelf here. Ameriie: Ameriie is the curator of the anthology. She’s a booktuber (Books Beauty Ameriie), a Grammy award nominated singer, an aspiring novelist (represented by Joanna Volpe), and an all-around beautiful person. Renée Ahdieh: The Wrath & the Dawn and The Rose and the Dagger (bonus stories for the duology: The Moth and the Flame, The Crown and the Arrow), and more. Soman Chainani: The School for Good and Evil Series (The School for Good and Evil, A World without Princes, The Last Ever After, and the Ever Never Handbook). Susan Dennard: Truthwitch, Something Strange and Deadly trilogy (A Dawn Most Wicked (prequel novella), Something Strange and Deadly, A Darkness Strange and Lovely, and Strange and Ever After). Sarah Enni: Sarah is the creator & host of the First Draft Podcast, and will be making her debut YA writing appearance in BYLTM. Marissa Meyer: The Lunar Chronicles (Cinder, Scarlet, Cress, Fairest, Winter (& bonus: Glitches, the Little Android, the Queen’s Army, Carswell’s Guide to Being Lucky, The Princess and the Guard, and round-up Stars Above), Heartless (+ The Gatlon School for Vigilantes & participation in A Tyranny of Petticoats). Cindy Pon: Serpentine and Sacrifice, Silver Phoenix and Fury of the Phoenix (& Want). Victoria Schwab: This Savage Song, The Archived and the Unbound (bonus: Leave the Window Open), The Near Witch, adult works as V.E. Schwab (Vicious, A Darker Shade of Magic), and more. Samantha Shannon: The Bone Season series (The Bone Season, The Mime Order, The Song Rising, & more), The Priory of the Orange Tree. Adam Silvera: More Happy Than Not and History Is All You Left Me and They Both Die at the End. Andrew Smith: The Alex Crow, Grasshopper Jungle, Winger and Stand-off, 100 Sideways Miles, and more. April Genevieve Tucholke: Wink, Poppy, Midnight, curator of Slasher Girls and Monster Boys, Between the Devil and the Deep Blue Sea and Between the Spark and the Burn. You’d think that might be all the contributors to the anthology, but Because You Love to Hate Me is different from most anthologies. The above authors will be writing short stories based on villain-themed prompts provided by booktubers! All booktubers will be paired with one author. They will write an introduction to that author’s story, and we’ve all already provided prompts for our authors to use as inspiration. You'll find out later who is paired with whom, and which villains are being used :). Let me rave about this anthology. Can I just say how much I love this sort of creative collaboration among readers and authors? We’ve seen it in the community for things like Litographs fanart T-shirts, extra content based on reader votes / input, paperback pages printed as appreciation for reviewers, etc., but this is first story collaboration that I know of, and I think that’s really neat. So, not only is this anthology cool because of the creative collaboration, but it’s also cool because OF ALL THOSE AUTHORS. Renée Ahdieh? Gorgeous, sensual writing that can add really great layers to characters and here, to a villain we love to hate! Soman Chainani? The School for Good and Evil has a great atmospheric start, and Chainani has already switched up the moral good/evil sides—I’m sure his villain will be compelling. Susan Dennard? Everyone at the Truthwitch launch had mentioned how the villain was intriguing and complex, and Susan will create something equally, if not more, exciting for this anthology! Marissa Meyer has already written a book on the villain of the Lunar Chronicles (aka Fairest), so her villain will be equally compelling. Uh, did you not see me ramble on about my love for Serpentine? Cindy Pon creates wonderful, multi-layered characters, and I can’t wait to read the villain she will write! Victoria Schwab! Vicious! Blurring the lines between what’s right and wrong, and who’s the bad guy – sounds like a recipe for creating another great villain! Samantha Shannon’s Bone Season series is on my all-time favorites list, and of course I’m excited to read about her villain! Adam Silvera has already dealt with moral ambiguity in More Happy Than Not: how does a place like the Leteo Institute exist? With his character-centric focus, Adam will create a great villain too. Andrew Smith has been compared to Kurt Vonnegut, so duh, he’ll create an awesome work. April Genevieve Tucholke has gorgeous, atmospheric writing and River from Between the Devil and the Deep Blue Sea was a fascinating, multi-layered morally ambiguous character, so hello awesome villain-to-be! Nicola Yoon created multi-layered characters in Everything, Everything and I’m excited to see where she’ll go next after such a powerhouse debut! Sarah Enni is making her YA fiction debut with the anthology, and that's really exciting too! BUT YOU KNOW WHO I’M MOST EXCITED FOR? Ameriie. I’ve been Ameriie’s critique partner for about three and a half years now, and all of her work is fantastic! Great writing and characterization, fast-paced, multi-layered plots, thematic works with story at the forefront, and I can heap on so, so much more praise. She's definitely an upcoming author to watch :), and I can't wait to see what see comes up with too. ARE YOU AS EXCITED FOR BECAUSE YOU LOVE TO HATE ME AS I AM? I hope so!